WASHINGTON, D.C. -- Sixty-seven percent of Americans say the laws covering the sale of firearms should be made stricter. This represents an increase of seven percentage points since last fall and is the highest in any Gallup survey since 1993. These results are based on a March 1-8 Gallup survey, the first conducted after the Parkland, Florida, school shooting in mid-February. The seven-point increase in public support for stricter gun laws follows a five-point increase seen in Gallup's October 2017 survey, conducted just after the mass shooting in Las Vegas. In the wake of the Las Vegas and Parkland shootings, Americans' desire for stricter gun laws has reached levels not seen since December 1993. The first time Gallup asked this question in September 1990, a record-high 78% wanted stricter gun laws. In the early 1990s, the violent crime rate in the U.S. was at an all-time high -- something the public was well aware of, with more than eight in 10 U.S. adults saying there was more crime in the U.S. In the mid-1990s, the crime rate began to fall, and Americans' perceptions of crime followed suit. In 1993, the federal government passed the Brady Bill, and it passed an assault weapons ban in 1994. 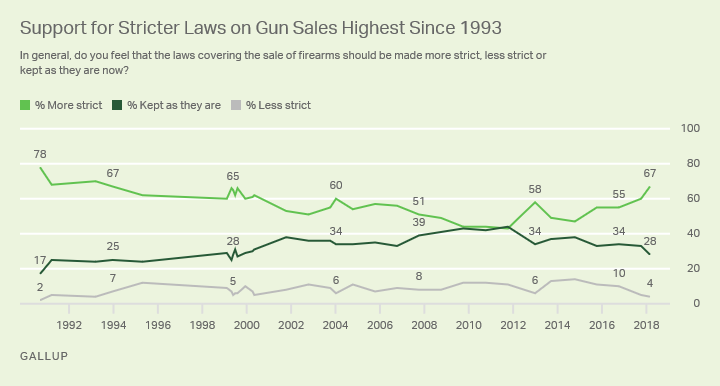 From 1995 to 2011, the percentage of Americans wanting stricter gun laws decreased from 62% to 43%. After the Sandy Hook school shooting in Newtown, Connecticut, in December 2012, 58% of Americans preferred stricter gun laws, though that spike soon subsided. Since 2014, there has been a 20-point increase in support for stricter gun laws, with most of that increase occurring in the past six months. 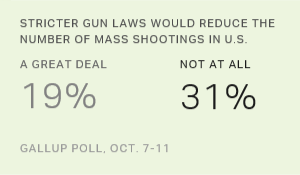 In addition to the two-thirds of Americans wanting stricter gun laws, 28% say gun laws should be kept as they are now and 4% say they should be made less strict. Both percentages have declined significantly in recent years. Currently, 90% of Democrats say they want stricter gun laws, compared with 65% of independents and 41% of Republicans. All groups are more likely to favor stricter laws than they were two years ago, but Democrats' preferences were already in place before the Parkland shooting. 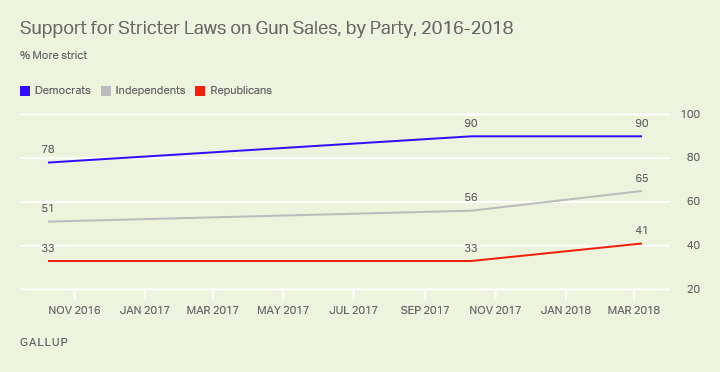 Since then, independents and Republicans have become more likely to want stricter gun laws. A slim majority of Republicans, 52%, prefer that gun laws be kept as they are now, rather than becoming stricter. Just 6% of Republicans, down from 13% in 2016, say gun laws should be made less strict. Concerns about guns since the Parkland shooting are also evident in the surge in mentions of guns or gun control as the most important problem facing the U.S. Gallup's March update finds 13% of Americans mentioning guns, up from less than 1% in early February, before the shooting occurred. The percentage mentioning guns in response to this open-ended question is the highest Gallup has recorded since it first began compiling mentions of gun-related issues in 1994. 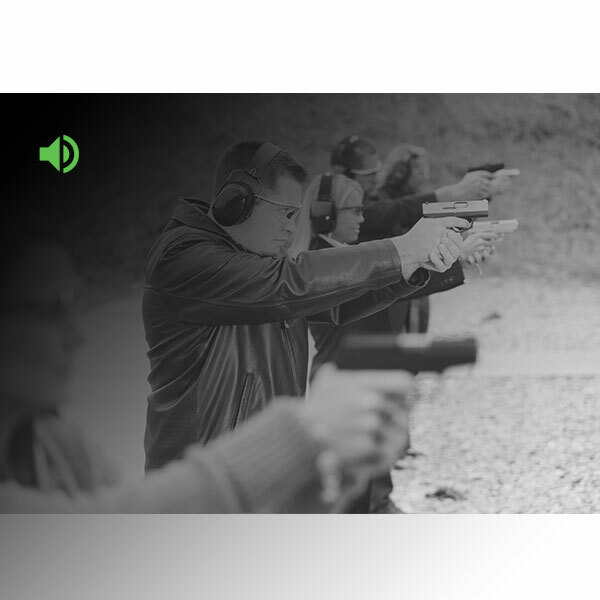 The previous high was 10% after the Columbine school shooting in Littleton, Colorado, in 1999. Just 4% mentioned guns in December 2012 after Sandy Hook, but that climbed to 7% in subsequent months as the Obama administration pushed for gun control measures. Gun control does not typically rank high on the list of most important problems. The average percentage mentioning guns has been 1% since Gallup began asking the most important problem question monthly in 2001. Sixteen percent of Democrats, 14% of independents and 10% of Republicans say gun control is the most important problem facing the country. Guns now rank second as the most important problem in the country -- behind dissatisfaction with government, which 22% of Americans mention. Immigration, race relations and unifying the country are also mentioned by at least 5% of U.S. adults. With the House of Representatives set to vote on new school safety measures this week, the gun issue is a high priority for Americans. The public's preferences for action are clear -- more Americans are calling for stricter gun laws than at any point in the last 25 years. Concerns about gun laws, as measured by the percentage wanting stricter laws and the percentage mentioning it as the most important problem facing the country, now exceed the levels seen after the Columbine and Sandy Hook school shootings. As a result, there is more public pressure on elected officials to address the situation beyond the measures being voted on this week, which mostly focus on steps aimed at improving school security rather than restricting gun ownership. Thus, it is not clear whether those moves will satisfy Americans' calls for action on guns. It is unclear whether the Parkland shooting represents a turning point in Americans' views on the gun issue. One indication will be whether gun control fades as the most important problem or stays high in the months ahead. The issue did subside in importance after Congress was unable to pass gun law changes favored by the Obama administration in 2013 following the Sandy Hook tragedy. 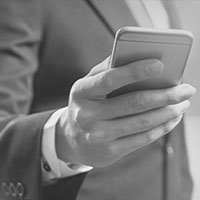 Results for this Gallup poll are based on telephone interviews conducted March 1-8, 2018, with a random sample of 1,041 adults, aged 18 and older, living in all 50 U.S. states and the District of Columbia. For results based on the total sample of national adults, the margin of sampling error is ±4 percentage points at the 95% confidence level. All reported margins of sampling error include computed design effects for weighting. Before the recent school shootings in Kentucky and Texas, 24% of U.S. parents said they feared for their children's safety at school.